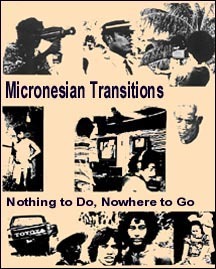 Part of the "Micronesian Transitions" videotape series from 1977 to 1983, this program examines the causes of unrest among young people between the ages of seventeen and twenty-five on Moen Island, Truk (Chuuk), and proposes possible solutions. Forces inside and outside Trukese culture, especially "modern" influences and alcohol abuse, are seen as contributing to the changes in Trukese society and suicide among young adults. See follow-up report: Changes in Truk. This program is of non-broadcast television quality and generally only suitable for academic or research purposes. It contains video glitches, image imperfections, and sound distortions which are not a product of the copying process but are due to technical limitations in the original edited recording. <>Producer: Xavier High School, Truk. Director: Eric Metzgar, Instructor. Senior Town Study Project students: Nelson August, Nick Benjamin, Banny DeBrum, Jerry Fagolimul, Heddleston Jeadrik, Newton Lajuan, Lino Maech, and Jacobus Rokob.